You don’t need to pay upwards of $650 for a new iPhone or pay full price for a new Android out-of-pocket in order to fix your device. There are temporary fixes for a few dollars and there are great options that run around $100-$200. 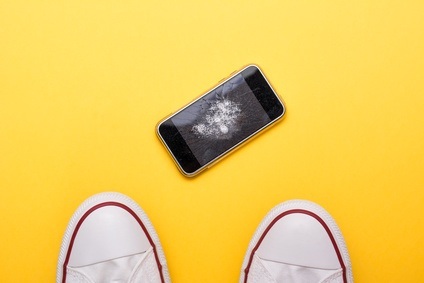 If you’ve found yourself with a cracked screen, here are several different repair options that could work for you. Call the Manufacturer - Before attempting any DIY screen repair solution, check with the company that made your phone. You could end up voiding your phone’s warranty by attempting to fix the screen yourself. You’ll want to check with the manufacturer first to see what options they offer. They may require you to mail the phone in, then wait while they fix it and return it to you in the mail. Screen Protector or Tape - While you’re trying to decide which repair option works best for you, you can use a screen protector or tape as a very temporary option. Assuming it is only the glass that is broken and you can still see images and responses to your touch, this fix will temporarily keep your screen from breaking even further. This also helps keep glass from falling off into your hands. Qualified Repair Shop - For the quickest, easiest solution to getting back to normal life with your phone, take it into to an expert you trust. Not only will the service providers be able to walk you through exactly what’s wrong with your phone in person, they will also be able to discover any additional problems that may have been caused by dropping your phone. This option runs around the same price as the DIY option, but with much less waiting and risk. For more helful tech tips and services contact the experts at Computer Corner.